Imagine a 12.5″ Windows 10 tablet with a 6th Gen Silverlake Core M CPU. Now imagine that that tablet has a dock for a keyboard. At this point you have a standard 2-in-1 with maybe a little more kick with the Core M instead of an Atom. Now add Thunderbolt 3 to that mix to make it compatible with high end storage & I/O devices. Next, let’s use some of that Thunderbolt 3 bandwidth for an external discreet graphics card. You have machine that goes from bit tablet to mini-workstation. This isn’t theoretical or a concept, Acer is actually nuts enough to build this and they’re calling it the the Aspire Switch 12 S. They have my attention. As I said in the opener, the Switch 12 S has a 12.5″ screen with a pair of options: 1920×1080 Full HD or an option Ultra HD, yes as in 4K, display at 3840 x 2160. 4K on something that can be used as a tablet is utterly insane. Either option has Gorilla Glass 4 with further Acer enhancements to maximize viewing angles and reduce eye strain. They’re flanked with Dolby-Premium compatible speakers Acer is calling True Harmony. Power is provided by the aforementioned 6th generation Intel Core M though Acer did not specify which ones. For I/O you have two full size USB 3.0 ports, Micro-HDMI, MicroSD, and your standard 3.5m audio jack. Its also has a 720P front camera and a 3D Intel Realsense R200 on the back. Memory is either 4GB or 8GB and you can have 128 or 256GB of solid-state storage. Its super light too weighting under 2 pounds as a tablet and just over 3 with the keyboard dock. Speaking of said dock, it uses Smart Hinge gold connections that secure magnetically while providing 6gbps transfer speeds and charging the keyboard. In other words, its designed to be a tablet when its a tablet and a laptop when it’s a laptop. For other accessories, that afore mentioned optional external graphics haven’t been fully fleshed out as for as details, but it’s coming. It won’t make the Switch 12 S a gaming PC, but it will give it a boost for gaming and professional graphics work. The next two questions are pretty obvious: When and how much? Its be available next month, February 2016. but the exact date has not been released. Pricing for the base model is a very affordable $999, but it’ll go up from there once you add the really intriguing options. Acer has come with a really intriguing option that lives in multiple worlds. 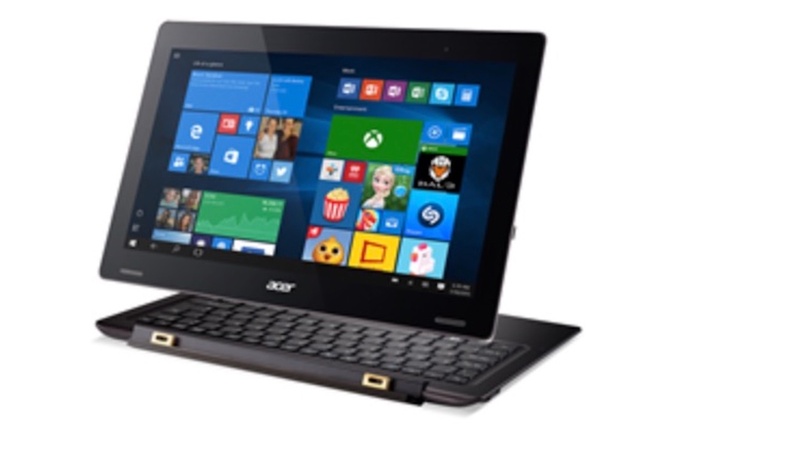 Hopefully The Acer Aspire Switch 12 S will live up to its great promise.